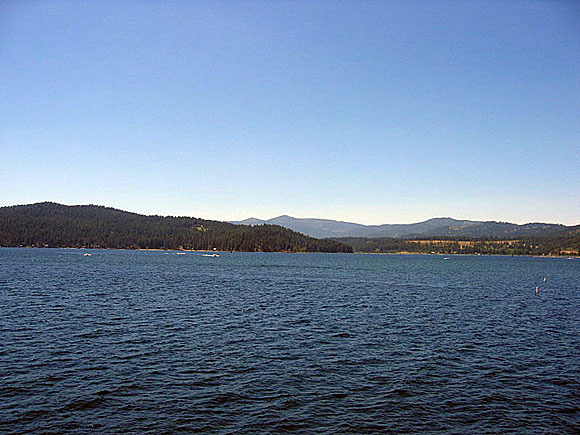 Coeur d' Alene Lake was the terminus for much of the Coeur d' Alene River-borne mine waste from the surrounding Coeur d' Alene Mining District before stricter controls on disposal of these materials took effect. The Coeur d´Alene (CdA) River channel and its floodplain in north Idaho are mostly covered by metal-enriched sediments, partially derived from upstream mining, milling and smelting wastes. Relative to uncontaminated sediments of the region, metal-enriched sediments are highly enriched in silver, lead, zinc, arsenic, antimony and mercury, copper, cadmium, manganese, and iron. Widespread distribution of metal-enriched sediments has resulted from over a century of mining in the CdA mining district (upstream), poor mine-waste containment practices during the first 80 years of mining, and an ongoing series of over-bank floods. Previously deposited metal-enriched sediments continue to be eroded and transported down-valley and onto the floodplain during floods. < The centerpiece of this report is a Digital Map Surficial Geology, Wetlands and Deepwater Habitats of the Coeur d´Alene (CdA) River valley (sheets 1 and 2). The map covers the river, its floodplain, and adjacent hills, from the confluence of the North and South Forks of the CdA River to its mouth and delta front on CdA Lake, 43 linear km (26 mi) to the southwest (river distance 58 km or 36 mi). Also included are the following derivative theme maps: 1. Wetland System Map; 2. Wetland Class Map; 3. Wetland Subclass Map; 4. Floodplain Map; 5. Water Regime Map; 6. Sediment-Type Map; 7. Redox Map; 8. pH Map; and 9. Agricultural Land Map. The CdA River is braided and has a cobble-gravel bottom from the confluence to Cataldo Flats, 8 linear km (5 mi) down-valley. Erosional remnants of up to four alluvial terraces are present locally, and all are within the floodplain, as defined by the area flooded in February of 1996. High-water (overflow) channels and partly filled channel scars braid across some alluvial terraces, toward down-valley marshes and (or) oxbow ponds, which drain back to the river. Near Cataldo Flats, the river gradient flattens, and the river coalesces into a single channel with a large friction-dominated central sand bar at Cataldo Landing. Metal-enriched sediments that were dredged from the central sand bar were deposited on Cataldo Flats, to form extensive dredge-spoil deposits. From the central sand bar to CdA Lake, thick deposits of metal-enriched sand partially fill the middle of the pre-mining-era channel along straight reaches, and form point-bars along the inside margins of meander bends. Metal-enriched sand and silt form oxidized bank-wedge deposits along riverside margins of pre-mining-era levees of gray silty mud. Metal-enriched levee sand deposits extend across bank wedges and natural levees, generally thinning and fining away from the river, toward lateral marshes and lakes, where dark gray metal-enriched silt and mud overlie silty peat, deposited before the mining era. Distributary streams and man-made canals locally diverge from the river, connecting it to lateral marshes and lakes, and metal-enriched sand splays locally fan out across the floodplain. At the mouth of the river, a bouyancy-dominated river-mouth bar crests beyond the ends of the emergent levees. Thick delta-front deposits of metal-enriched sand slope from the river-mouth bar to the bottom of CdA Lake. Download OF99-548 as a PDF document (1.2 MB). Download all 11 map sheets maps-eps.tar.z as one package of EPS files (10.4 MB). Download OF99-548.tar.Z the entire Digital Database contents of this report, including all Arc-Info and all ArcView GIS files inone package (9.7 MB download, 47.1 MB uncompressed). Download the FGDC-compliant metadata for this report (cdasurf.met.txt; 20 kB).